Take a better trip with AAA Map’n’Go 2.0! It’s a remarkable new CD-ROM travel planner that automatically finds the fastest, shortest, or scenic route to the destinations you select. AAA Map’n’Go 2.0 has complete AAA TourBook® information on rates, amenities and atmosphere for over 43,000 lodgings, campgrounds and restaurants. Locate individual addresses on detailed maps of 241 North American cities. With an Internet link, you can integrate up-to-date information on highway construction, events and weather. 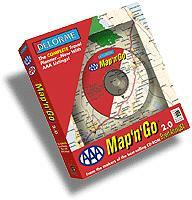 AAA Map’n’Go even links to the Global Positioning System. USA Today calls AAA Map'n'Go 2.0 the "latest and most technologically snazzy entry" in the new generation of CD-ROM trip-planners. Early users love it, too! DeLorme, maker of the best-selling CD-ROM, Street Atlas USA®, specializes in computer maps and databases for the consumer, education, business and government markets. We also publish printed atlases of 27 states. You can get a live taste of two of our products, Street Atlas USA and Map'n'Go®, with CyberAtlas™ and CyberRouter™, or jump right in by pushing one of the buttons below. Use the Excite! search engine to search DeLorme's Web site. See what else is hot these days on our web site. Rated among the top 5% of all sites on the internet by Point. A Yahoo! Computing Site of the Week Selection, May 6, 1996. Copyright © 1996 DeLorme. All Rights Reserved. This page was updated July 27, 1996.